Mozilla Thunderbird is world’s leading email client software; it is free, open source, cross platform, works flawlessly, designed to handle high flow of emails. Not only email client, it is one of the best chat and news client app as well. Mozilla Thunderbird is being used by millions of people all around the globe on daily basis to cater their email and news needs. It is lighting fast app and is extremely lightweight, it hardly contributes to your system load or high resource consumption. Thunderbird has been in the world from around 10 years now. Its development gained momentum in 2004 and in 2006 the very first major release of this app was made public. Mozilla has been under continuous development phase since then and today we are happy to let you know that 38.1 version of this wonderful client software is out there. Mozilla Thunderbird supports multiple accounts configuration and using more than one news feeds. The configuration process for the email account is simple and automatic configuration option is suffice for most user. With its built-in spam filter, Bayesian spam, it makes filtering the spam and junk emails are piece of cake. If your email server mail scanner is not catching any spams, not to worry, your local client thunderbird will help you discard junk emails. You can customize and extend the functionality of thunderbird using various free and paid plugins. You can use themes to change the look and feel of your email client software. Thunderbird supports a wide range of protocols including but not limited to POP, IMAP, S/MIME, OpenPGP, etc. Thunderbird supports both Maildir and Mbox inbox formats. The internal database engines for Thunderbird are Mork and Mozstorage. Thunderbird is a very secure app, it claims to provide enterprise and government level security and encryption. The latest release 38.1 is a maintenance release mainly, which means majority of the updates in this release are bug fixes. You can review release notes to see whats exactly been fixed in this version. The below mentioned steps should work for all popular Linux operating system. First of all download Thunderbird 38.1 for your Linux your distribution. Once download process is complete, go to the download location and run following command to extract the downloaded file. Now go into the extracted directory by running. 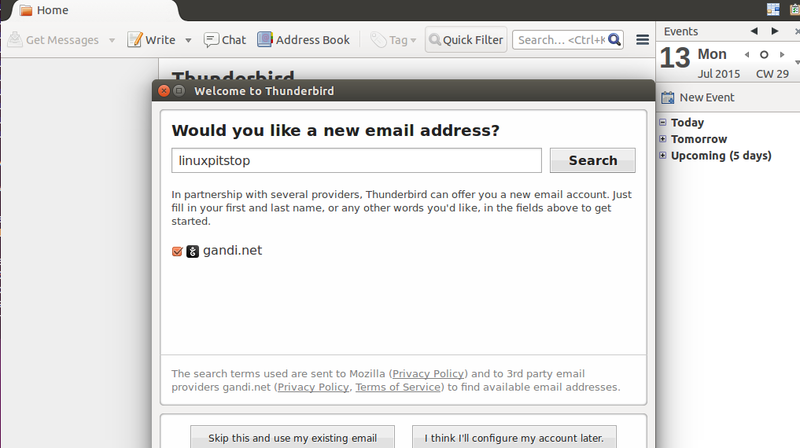 That’s it, as soon as installation is complete, launch it from Applications >> Mozilla Thunderbird option. You can head to Help >> About option to see the version for your thunderbird app. Mozilla Thunderbird 38.1 has been launched just a month after 38.0 release, so it should be enough to assure that Thunderbird receives proper and timely updates. It is a very successful cross platform email client application, being used in small to high scale organizations and other individual desktop users. Nice article. I have been using Mozilla Thunderbird for 8 years, and have watched it grow from strength to strength. It has never lost a message and it is the second most used piece of software on my laptop… after Mozilla Firefox of course! I’ve been hearing word that Thunderbird is getting bloated and has some naggy bugs. Well, I’ve heard this about the Windows version. Any news of this? Which is the BEST version of Thunderbird that was stable? I’m still haven’t decided on a Linux mail client yet. I hear the SeaMonkey Mail client is actually pretty good. It is also based on the old Netscape Mail client. Do you have any idea what goes wrong? It would be a great help! !